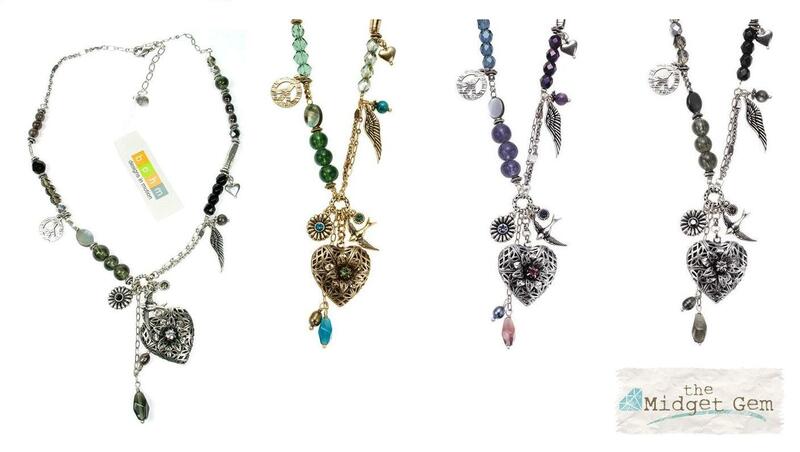 This romantic series combines burnished precious metal gold and silver plates, fine filigree textures, bird and heart charms, glass beads, freshwater pearls, shell and Swarovski crystal elements around Bohemian heart lockets and flowers. It has a very vintage appeal making it a classic wardrobe addition. Available in silver/purple/blue, silver/black/grey and gold/green. Stretch style charm bracelet. The various charms and beads measure from 5mm (freshwater pearls) up to 2cm/20mm (the filigree heart locket). It gently stretches to fit most wrists comfortably. It measures approx. 18cm/7 inches inner circumference un-stretched. A beautiful mix of Swarovski crystals and glass beads. Adjustable charm bracelet. The various charms and beads measure from 5mm (freshwater pearls) up to 2cm/20mm (the filigree heart locket). Adjustable length 19cm/7.5 inches to 23cm/9 inches. Filigree heart locket earrings with enamelled floral overlays set with a central Swarovski crystal. Hearts measure 2cm/20mm. They measure 4cm/1.25 inches in length and 2cm/0.75 inches wide. French clip fastener for pierced ears. Hoop earrings for pierced ears. Beads measure from 4mm up to 2cm/20mm (bird charm). They measure 7cm/2.75 inches in length and 3cm/1.25 inches wide. Bird, fine chain, freshwater pearls and crystal earrings. Beads measure from 5mm upto 2cm for the bird charm. French clip fastener for pierced ears. They measure 5cm/2 inches in length. Bird cascade earrings. Beads measure from 5mm up to 1.5cm/15mm. French clip for pierced ears. They measure 7.5cm/3 inches in length. Charm and bead necklace. The various charms and beads measure from 5mm (freshwater pearls) up to 2.8cm/28mm (the filigree heart locket). The length of the front drop is 2.5 inches/ 6.5cm/. It measures 16 inches/41 cm to an adjustable 19 inches/48 cm. Heart locket necklace. 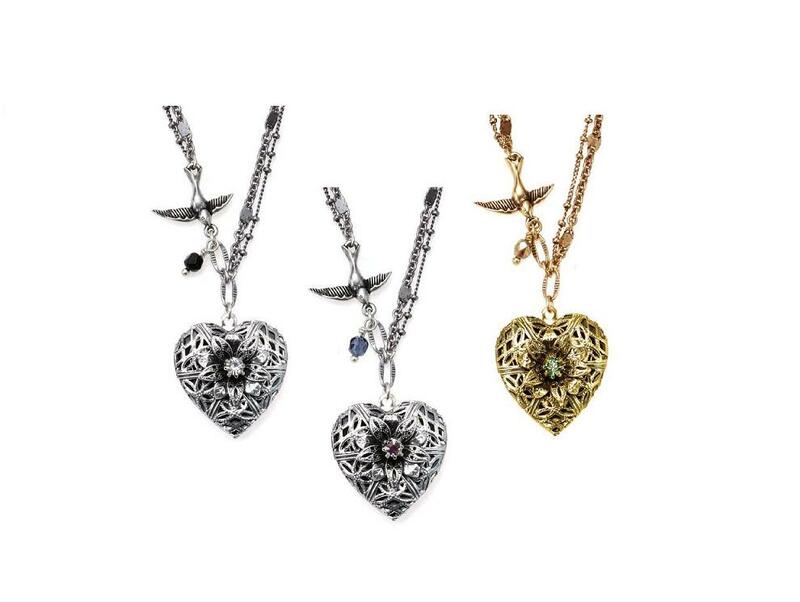 The bird charm measure 2cm/20mm up to 2.8cm/28mm (the filigree heart locket). It measures 16 inches/41 cm to an adjustable 19 inches/48 cm. Heart locket on a longer length necklace. 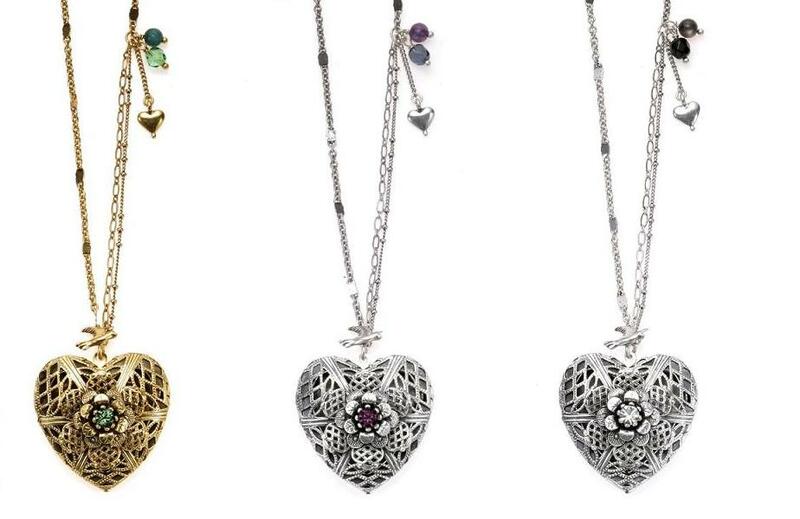 The filigree heart locket measures 4cm/40mm. It measures 32 inches/81 cm in length. Heart locket and charm cascade necklace. 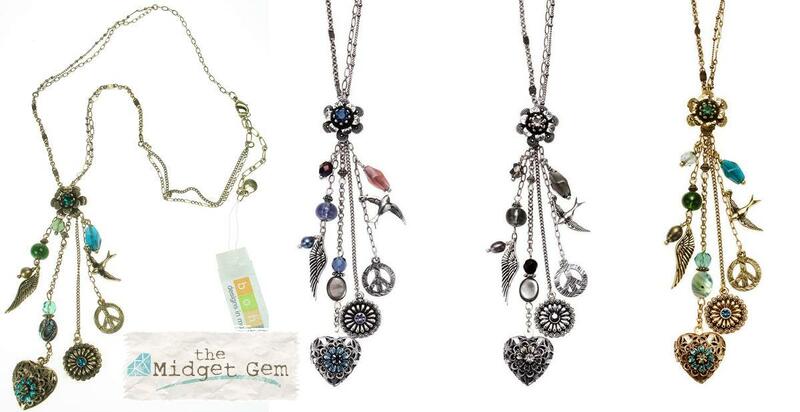 The filigree heart locket measures 2cm/20mm.Length of the tassle pendant is 11.5cm/4.5 inches. It measures 18 inches/46 cm to an adjustable 21 inches/53cm in length.